NASA astronaut Joe Acaba captured this photo of the southern lights in a dazzling aurora display on July 14-15, 2012, during an uptick in solar activity. A new photo of the southern lights by astronaut Joe Acaba convey only a portion of the amazing view from his window on the International Space Station during a weekend photo session to catch the auroras over Earth. 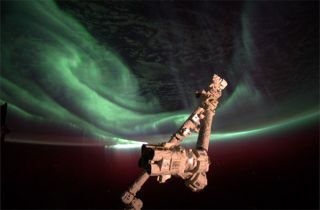 Acaba watched the auroras on Saturday and Sunday (July 14 and 15) from the station's observation deck, a seven-window cupola that offers astronauts a 360-degree of space and the Earth below. On Saturday, Acaba took a break from a workout session to gaze down at Earth as the space station made a southern night pass. With a recent uptick in the sun's activity, including a major solar flare last week, he was hopeful to see at least some auroras. At the time, the space station was home to three people: Acaba and two cosmonauts. Even the space station's veteran commander, cosmonaut Gennady Padalka now on his third tour in charge of the outpost, was amazed, Acaba explained. Auroras are caused when charged particles from the sun interact with the Earth's upper atmosphere to create a bright glow. Because the activity is concentrated over Earth's poles, they are known as the aurora borealis (northern lights) in the north, and the aurora australis (southern lights) in the south. Acaba's Saturday aurora show set stage for Sunday, when an intense solar storm from a July 12 solar flare supercharged Earth's auroras. Editor's note: If you snap any amazing photos of the northern or southern lights that you'd like to share for a story or gallery, please send images and comments to SPACE.com managing editor Tariq Malik at tmalik@space.com.